Click the link that says: "Click here while logged in to Zoho CRM to generate a new Browser Mode token for Proposify"
Once connected, you can set up the proposal journey as it moves through the sales process. You can choose individual contacts you want to import, or you can select them all to import to Proposify. 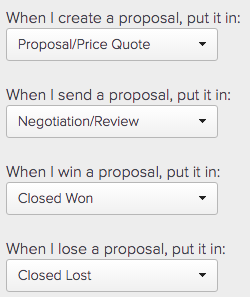 When you create proposals, you can decide to create a new deal in Zoho or not. If you have existing deals in Zoho, you can link the proposal to them as well. After the proposal has been created, you can follow the progress right in Zoho, and access the proposal in Proposify with just one click. Once the proposal has been Won in Proposify, you can see the proposal value and download the PDF in Zoho.